Sunday 18th January was the last Auckland 70.3 and also doubled as Asia Pacific Champs, I was privileged to have such a race right on my doorstep. First of all I'd like to say a massive thank you to everyone who was out there supporting and cheering, it made for a fantastic atmosphere! Since making a step up to race internationally I've discovered a few extra challenges outside of swim, biking and running; preventing sickness and developing my mental grit. A Lot of people say that if you make it to race day without getting sick or injured you've already beaten half the field. Since Challenge Gold Coast at the end of August I have struggled with upper respiratory track infections on four occasions. Just as the exciting times of big gains start, my body caves in and I take two steps backwards. It's a timely trial and era process of learning what your own body can and can't handle. The frustration of sickness combined with other factors made me question if I was making the right move in the sport, and seemed to increase the apprehensiveness and nerves I should get pre race day. As many will remember I used to go into a race a tad too relaxed; usually forgetting a pair of shoes or a wetsuit! I progressed to getting butterflies race morning which turned to adrenalin once the gun went off. Recently this anxious energy has been getting the better of me. A week out from both Bahrain and Auckland I was feeling seriously sick at the thought of being on the start line. 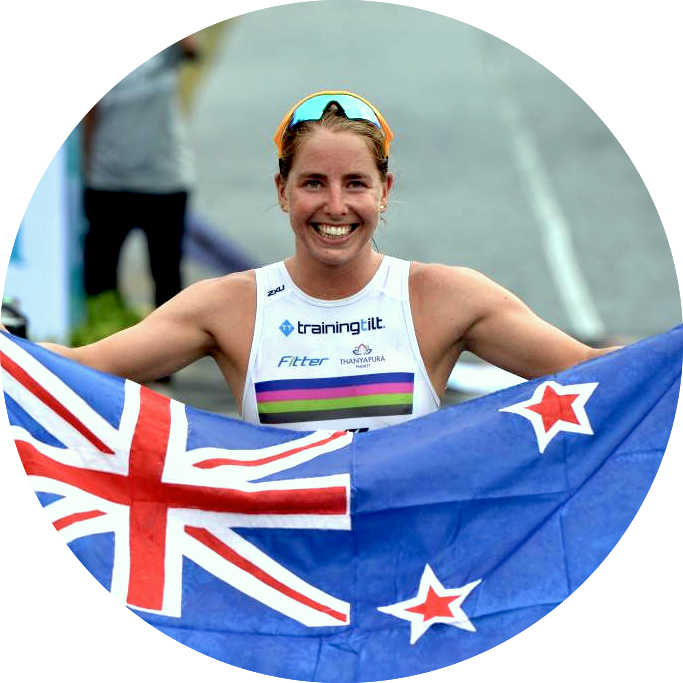 A few days out from Auckland 70.3 I sought some help from people with valuable experience in the sport and have started to develop the vital trait of mental toughness. I had a satisfying and solid race. Race day started at 6.18am at queens walk in the viaduct. I started a lot faster than I needed to considering the size of our pro women's field, but I felt strong and moved onto Ginas feet at the first buoy. Unfortunately between the second and forth buoys I had some serious sighting issues and lost both feet and about 15m. I exited the water in third place 40s down on Gina and 2mins down on Meredith. The start of the bike was particularly technical with multiple sharp turns and wet steel tram tracks. The first lap of the bike leg headed north over the Auckland Harbor bridge, up the motorway to constellation drive where we did a loop in the industrial area. Gina and Meredith both gained on me in this section. We then came back through town for two laps of the water front; home grounds of my introduction to cycle racing so I felt right at home. I had a swift transition and was onto the run along the water front. I felt brilliant for the first 5km to the turn around and was making good gains. However I struggled in the last third of the run and loss my made time. I finished in third place behind Meredith Kessler and Gina Crawford, two very inspiring and encouraging athletes. Next up is 70.3 Putrajaya in Malaysia 5th April. I will also do some short distance races between now and then to keep the momentum flowing.